We are pleased to announce our participation in the 42for42 charity event in November, 2018. 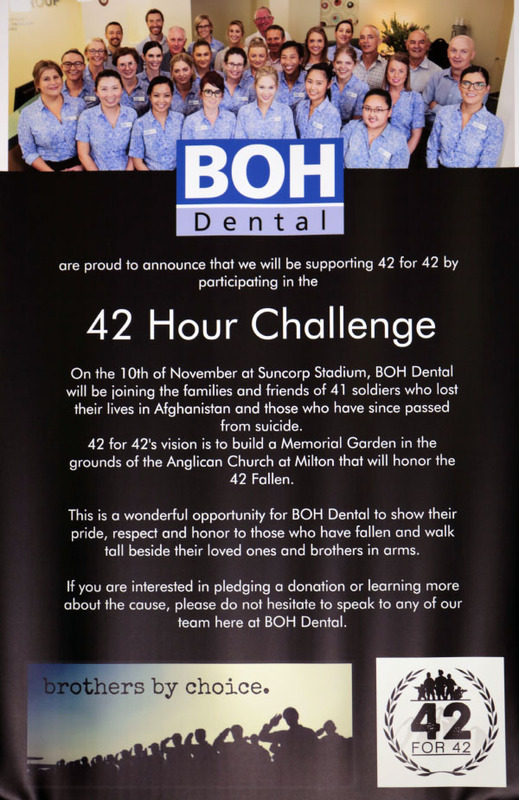 The event will see our team of twenty BOH staff walk together while carrying 42kg to signify the soldiers lost in Afghanistan. Any donations raised will assist veterans and their families set up a memorial space in Milton, with more information available below. The goal of 42for42 is to demonstrate the powerful symbolism of people coming together for a common cause, moving forward in life, sharing our burdens, helping carry the load, and taking one step at a time to achieve our goals. You can support BOH Dental by talking to our reception staff, or by donating directly on our team page via the button below. 42for42 have provided some artist depictions of the Memorial they are hoping to create. It will be situated in Milton, Brisbane, near Suncorp Stadium. For more information, check out the 42for42 page here.